I'm very honored & excited that I was awarded a beautiful OOAK Art Work for participating in the fun SANTA CLAUS FEST. This absolutely beautiful 'FLY ME TO THE MOON' Gothic Arch is an Original One Of A Kind (OOAK) Art Work by the very talented HERMINE KOSTER all the way from The Netherlands. Dear Santa & Santa's Helpers,TINA, BELINDA & HERMINE; the originators of the International Internet Santa Claus Fest 2007. This was so much fun & I can't wait for the next Santa Claus Fest 2008. THANK YOU, THANK YOU ALL! What a great way to start a wonderful New Year!!! Dear Hermine, thank you from the bottom of my heart! 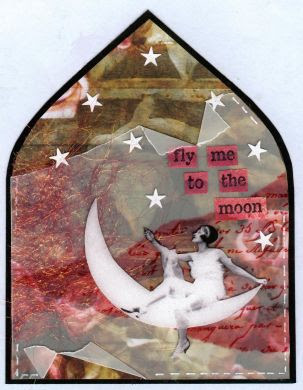 I love your 'FLY ME TO THE MOON' Gothic Arch Art Work. It's so MAGICKAL!!! Lovely gothic arch art piece...what a nice gift from afar...LOVELY & enjoy! Hi Chris, thanks for the lovely greetings & salutations. Yes, I feel very honored by the kindness from the International Artists. Thanks SO much on my updated website! I worked really hard on making everything coordinate; Blog/Website/eBay About Me/etc. Wow - congrats!! What a wonderful piece, Lyndy! HEY CHRIS, LOVE YOUR CHERRY EYE CANDY!!!!! My MOM (since I was 5 years old) used to give me a box of chocolate covered cherries for the major Holidays: Christmas, Valentine's Day, My Birthday, Halloween, Thanksgiving & back Toooooooooooo... FIVE, it was all about the number 5 for me. Do you know 'My Parents Burial Plot' number is 555. We constantly see 5:55 PM or AM when we ask each other important questions. It is wonderful to know they are there for us!!!!! A VERY LUCKY NUMBER FOR ME & MY FAMILY! We recently won a 555 Lottery, only $5550.00, but what the HECK, it paid the mortgage for one month!!!!! Hi Carolee, I was sooooo honored by the International Artists for just submitting my BLOGSITE for perhaps a MERRY CHRISTMAS, JUST COME BY & VISIT, & OMG, I was awarded a beautiful OOAK of ART WORK for my OPEN HOUSE SANTA CLAUS FEST decorations. SO YES, I feel very honored by the kindness from the International Artists. Hope all is well, AND I am happy you flew by for a visit! WOW Lyndy must be serendipity!!! FUN read on the 555 background with your Mom! Hmmm I must be plugged into "something" and not even aware! PS: My Mom always gives me Queen Ann's too, to cheer me up throughout the year AND on holidays too!!! Thank you, it looks gorgeous on your blog. Hi Chris, Mom's always seem to know when we need a special treat to cheer us up... I miss my Mom & Dad sooooooooooo much. Whenever, I see that 5:55 PM or AM I always say 'Hi Mom & Dad, Miss You, Love You Both Forever & Eternity'. Dear Hermine, I'm a lucky girl to have made your acquaintance. Thanks again for everything including the link(s). You're a kindred spirit & kind soul! AND A FANTASTIC ARTIST! Congratulations on that great honor, Lyndy! Beautiful art worthy of your beautiful blog! I haven't had one this year and now you're making me wish I had bought myself a box! Thank you SOOO much for the lovely ecard, and your beaming praises. I am thrilled that you like your new black kitty babies :) :). I thought you might like the crepe garland I made for one of your displays. I am certain that your lucky black kitty cat lives a life that we would all envy! Don't they all?? Hee hee..
Have a fabulous day, it's a gorgeous weekend!! WOW CHRIS, maybe we should buy some lottery tickets. AND you were #5000 visitor to my blogsite? AMAZING, YES TOTAL SERENDIPITY! OR SPOOKENDIPITY... LOL! 5 being my lucky number & all. Will we seem to keep hitting the jackpot anyway you look at it! Hi Becky, thanks for the kind compliments, eMails & eCards. Spoken from the heart from a kind considerate lady, best friend/sister & FABULOUS artist! It was a real award, not virtual & I was very honored to have received it for my special Holiday Blog for the Santa Claus Fest. I work very hard on my Blogsite. I spend many hours on trying to make my blog fun & interesting. Like you said a wonderful place for everyone to get inspired. I agree with you that blogs for PR should remain not to personal. PR meaning if you're showing/selling anything especially art than it's better to stay focused on the topic at hand. Looks like some very savvy people are starting to have two blogsites attached, one for art sales & the other for musings. I don't have time to blog everyday, I have a very busy life & talking about nothing is a waste of my time & everyone else's. Besides when I spend several hours on a blog I prefer it stays up a few days, like you & also those incredible artists that want their PR for their artwork. OK, now for the sweet talk. My Mom used to buy me Brach's Dark Chocolate Covered Cherries, but they stopped making them in 2003. Cella's has been making them since 1864 & they have the same cordial effect with the clear cherry syrup surround. • Delicious cherries covered with real dark chocolate. • Cella's - Taste the difference! • Since 1864 Cella's has been devoted to only one thing - producing the very best quality chocolate covered cherries. • Our chocolate covered cherries are created in a very special way, making them unique in the candy world. • Cella's cherries are surrounded by a delicious 100% clear liquid then encased in real dark chocolate. • This process creates a confection which is truly special. • Our very best goes into each box of Cella's 100% liquid center Chocolate Covered Cherries - you'll savor the goodness with every bite. • They make the perfect gift for someone you care about or as a special treat for yourself. AND only $2.99 at Walgreens instead of $20.00 elsewhere. Plus you can buy them online too! Hi Kitty, you're very welcome. AND all the praises for you are well deserved! Everything is absolutely BEAUTIFUL. Thank you my dear & talented friend. YES I was # 5000 and love Spookendipity!!! Thanks on my "Valloween" PC's!!! LUCKY 555 wishes right back at you!!! Hi Emily, thank you for your lovely comment & stopping by. Your children are beautiful & those photos you take are wonderful.